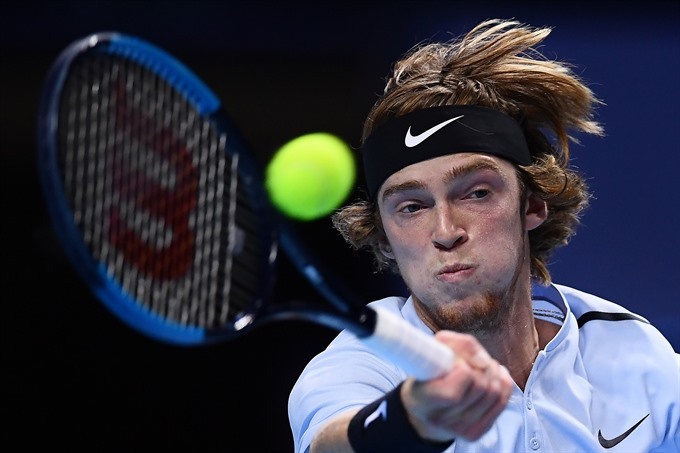 MILA — Top seed Andrey Rublev reached the ATP NextGen semi-finals on Thursday, edging out Canadian shot-maker and third seed Denis Shapovalov 4-1, 3-4 (8/10), 4-3 (7/2), 0-4, 4-3 (7/3). Russian star Rublev became the third semi-finalist of the inaugural tournament after Hyeon Chung of South Korea and Croatia’s Borna Coric. Later Thursday, Karen Khachanov’s hopes of squeezing into the last four ended when Coric battled to a 3-4, 2-4, 4-2, 4-0, 4-2 win. Khachanov’s defeat means that Russian compatriot Daniil Medvedev, who earlier defeated Jared Donaldson in four sets, will make up the semi-final line-up. "It was a really, really tough match," world number 37 Rublev said. "I’m really happy that in the end I made it."